“Happy Feet’s Incredible Journey – The story of the world’s most famous penguin. Age: 4 – 8 year olds. Theme: Environmental, the life of, hope, survival, animals, learning. Opening Page: I’d been swimming for a very long time. I don’t know how long, but it was getting hard to move my flippers. that’s when I noticed I was close to land. Synopsis/ Back Page: On 21 June 2011 a lonely emperor penguin stepped onto Peka Peka Beach near Wellington and into the hearts of the world. He had swum further from his home in Antarctica than any emperor penguin ever recorded. What did he think of the strange place he had come to? What did he think of the people he met? Why did he eat all that sand and get so sick? And how did he feel when it was finally time to go home? By the time he left New Zealand Happy Feet was the world’s most famous penguin. This is his story. Written in first voice, we enter the mind of this amazing cute animal, his thoughts about his treatment and his handlers and the visitors who came to see him. Each page has been cleverly set out with photos taken during his stay, and a note pad print of “Did you Know” facts about the emperor penguins, their survival, habitat, and information on how they kept Happy Feet (as he was named) alive and people involved. The pages background is simply illustrated in clean blue hues. Why I like this: The illustrations and photos are very informative a great resource and discussion book for schools inviting children to take interest in the Antarctic and life there. The illustrations give this sweet little guy a sense of humour , one illustration shows him holding his x rays commenting ” I must have been one sick penguin…..” Referring men in jackets as penguins. While we smile and learn much from this little character we also sympathise his anxious wish to return home. Children and adults will love this wonderfully set out picture book about an event that actually happened and the people who cared. When Happy Feet was released back into the sea a transmitter attached to him stopped transmitting after some time and he has not been heard of since…. many speculate what might have happened. What I liked most is royalties from this book go to Forest and Bird’s Places for Penguins programme. http://www.stuff.co.nz/environment great environmental information website. http://www.ourfarsouth.org/Farewell-Happy-Feet.aspx Farewell messages from people world-wide. http://www.wellingtonzoo.com/content/animals/animal-stories.aspx Wellington Zoo website of animal stories. This entry was posted in Children's literature, Picture Book Review, Reading Aloud and tagged Happy Feet. Bookmark the permalink. I didn’t realize his story had been made into a picture book. Great find, Diane. I couldn’t see it on Amazon. Do you know where might sell it? Hi Joanna, Glad you liked it. Thought of you when I bought it for my inquisitive nephew…..
That Gareth’s website is COOL! I checked out the “Our Far South” (very cool…literally 🙂 ) and the “World by Bike” . Thanks for telling me about it!! I’l look more after school. Hi Erik, didn’t realise you had posted here to. Yeah isn’t Gareth’s website cool…glad you liked. it. I love books like this, that tell true stories and show photographs and share information in a way that’s accessible to children – preferably with a happy ending 🙂 There is so much to love about this, right down to the fact that royalties are donated to a worthy cause. Thanks so much for sharing. I can’t wait to read it! LOL…. no worries Susanna…. that will teach me for being in a hurry… and I never thought that…lol. So pleased you liked the book. 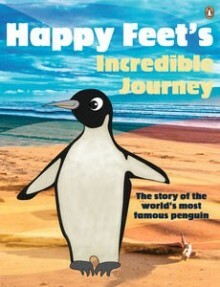 It is indeed a great book for kids, informative while still seeing the world through Happy Feet’s eyes. We like to believe during his energetic adventures back under the sea, the radar monitor slipped off….. who knows! The movie called Happy Feet (that I’m not super fond of) – I like the story line in the movie, is this where that story idea came from? This book looks great! I like the story plot. Here’s a coincidence, we both picked conservation books this week 🙂 I wonder what ever happened to the penguin…. Hi Erik, No the movie was made long before our Happy Feet arrived. This book is mostly based on a factual event only last year. It’s very sweet and as I said to Susanna we like to think our adventureous little guy caused the monitor on him to slip off. … no one knows! Glad you liked this…. and yes Great Minds think alike….lol.! I’ve never seen the movie. We’ll have to check out the book. Thanks for this one. Hi Stacy, movie and book are totally different, our little guy turned up only last year and given the name Happy Feet. You will love this book I am sure…. Thanks for stopping by. Never seen the movie? I LOVE the movie! The book sounds pretty cool, more on the actual facts; I’m sure they’re very different. I agree that it’s very cool that the royalties are donated to the Penguin Program. Thankyou Christie. The movie is not based on our penguin. He only appeared last year for a few months and they gave him a 50 – 50 chance of survival. He’s amazing little guy. Glad you dropped in I hope you will call again. Thankyou Natalie. Its a cute book, with cute story yet factual as well. Do come again. Wow that’s a quick turnaround to make the book from the real story so quickly. How cute! Yes it is….. guess when it is based on something like this where its also enviromentallly friendly, and for a cause……. why not! Glad you like it. My son LOVES books like this that are based on a true story. I think it helps to engage the kids even more. Great choice! Yes I am sure he will. So educational as well as a great story. Thankyou Julie. I didn’t even realize that the movie (which I’ve heard about, but haven’t seen) was based off a true story – and this is it. Would be interested to see! Sorry Miranda no the movie is not based on our little guy. Our penquin was given the same name as the penguin in the movie because they thought it suited him. The book is lovely I wish you could read it. Try the link I gave Joanna above. This sounds wonderful. I will add it to my “need to read” list. Thanks for reviewing it this week. Thankyou Penny. I think you will find it adorable and very educational. Came again. Great choice Diane! I love real life stories about animals. I am so glad they documented everything and wrote a book — I didn’t realize one existed. I think we all hope that the monitor simply stopped working. Thankyou Pat, so glad you liked this one. This little guy made headlines around the world. You may have heard of him in late August when he turned up. Lets hope it did just slid off and he is enjoying himself back home. I just love penguins. There is something about them that really does seem truly happy! Thanks for this recommendation. LOL yes they are real cute… I love them. Hope you to can access the link I gave Joanna above. The book is not readily available outside New Zealand. But try that link. Do come back again Amy. I remember this story. How cool it was made into a children’s book. Yes, I agree I almost positive it slipped off and he is happily swimming around his home 🙂 I love picture books like this that are about real life animals. They are great teaching tools. My students will immediately connect this with the Happy Feet movie thus building on some prior knowledge. It would be fun to compare/contrast the two. I also have a couple of students who are researching penguins right now. This would be great for them.. Thank you for sharing! this would be great for classroom research. It is not connected with the movie, the name only was given to our penguin, thats all. I am sure your students would enjoy the book. see link above, hope you are able to access the book. Thankyou Jennifer glad you liked the review and the book. Come back anytime… loved having you. I love penguins and this book sounds great! Thanks for sharing. Thankyou Jennifer glad you liked it… I think they are adorable to. Come back anytime. My husband and I watched the movie…and thought it was funny and touching. Looks like an awesome list of resources that parents and/or teachers could use for lots of activities and info…thank you, Diane, for sharing this one with us! Your very welcome vivian. Glad you liked my choice. Another great book! Penguins are such funny creatures and Happy Feet’s story is an unusual one. Thanks for sharing! Yes they are very cute and I am glad you liked the story. Hope you are able to check it out. Thankyou Heather, come back anytime. Thank you for sharing…Happy Valentine’s Day and wishing you all the best. Thankyou island traveler, glad you liked it. Happy Valentines Day.